Note: this piece reflects cultural traditions in the context of heterosexual couples and should not be taken as representative of the variety of cultural practices. In typical Western culture, Valentine's Day is often celebrated by exchanging chocolates, flowers and other objects of affection. Other parts of the world celebrate romantic love — or the lack thereof — as well, but in starkly different ways. From celebrating love every month to consuming fried donut sticks shaped like the number one to celebrate being single, here's a look at how Japan, China and Korea celebrate Valentine’s Day. In most parts of the world, men are typically expected to present gifts such as flowers or chocolates to women. In Japan, it’s the opposite. On Valentine's Day, women — single or not — are expected to give chocolates to their significant other, friends and family. Of course we can’t all afford to give $50 Godiva gift boxes to all our friends, or to ourselves for that matter. Thankfully, the chocolates that are given to friends and family, also known as giri-choco, are relatively inexpensive. In contrast, chocolates given to a partner or romantic interest are either handmade or costly — these chocolates are known as honmei-choco. 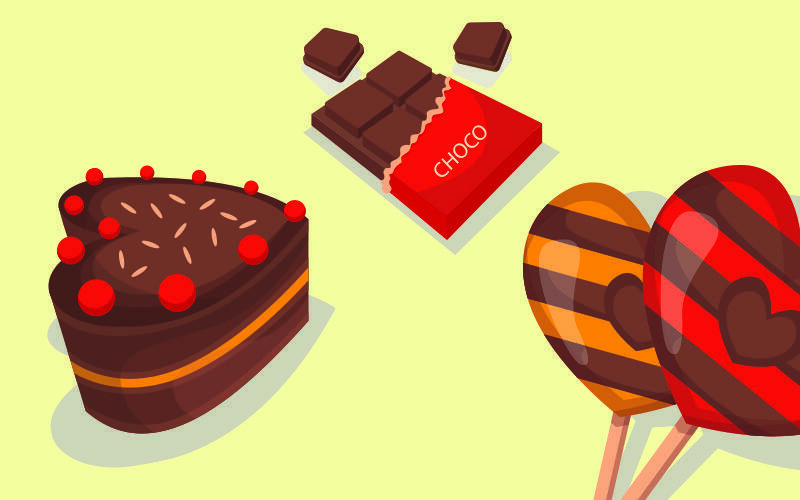 But to show appreciation for the chocolate, recipients are expected to return a gift that is white — such as marshmallows, white chocolate or cookies are some examples — on March 14, also known as White Day. Like Japan, women usually give chocolate to men. However, Korea has raised the celebration of love by a few thousand notches by celebrating it on the 14th day of every month. These holidays, if you can keep track of them all, are celebrated with your special someone or with friends and family, with the exception of April. This day is known as Black Day. On Black Day, single people come together to celebrate their singleness. They indulge themselves in all things black — black clothes, black coffee and black bean noodles to name a few. Aside from celebrating the Western Valentine's Day, China has another celebration of love known as the Double Seventh Festival. This festival takes place on the seventh day of the seventh month under the Chinese lunar calendar, which means it changes every year on the Gregorian calendar. Traditions during this festival include testing women on their needle threading skills under the moonlight or their fruit carving skills. Traditionally, this was how females would prove their some of their “skills” to potential husbands. Like in Korea, there is also a holiday for single people to rejoice about being single. On November 11 (11.11) those who are single eat four sticks of fried donut (also known as yóutiáo) and a round steamed bun to represent the date 11.11. People also buy ridiculous amounts of stuff online — companies have marketed this as a day to treat yourself. It's basically like Black Friday — or more accurately, Cyber Monday — but even scarier.